*PROMOTION DESCRIPTION: Win Free Furniture Sweepstakes (the “Sweepstakes” begins on September 12, 2017 and ends on November 22, 2017 (the “Promotion Period”). The Promotion Period will be divided into seventy (70) Entry Periods. The first Entry Period will start on September 12, 2017 at start of business and end on September 14, 2017 at close of business. The remaining sixty-nine (69) Entry Periods will each last one (1) business day (from store open to store close; store hours may vary by location). Non-winning entries WILL roll over to subsequent entry periods, if any. Entry in the Sweepstakes does not constitute entry into any other promotion, contest or sweepstakes. By participating in the Sweepstakes, each entrant unconditionally accepts and agrees to comply with and abide by these Official Rules and the decisions of Spectrum Reach, 8087 Washington Village Dr., Suite 204, Centerville, OH 45458 (“Sponsor”), which shall be final and binding in all respects. ELIGIBILITY: Only legal U.S. residents who are eighteen (18) years of age or older and reside in the Spectrum – Columbus, Cincinnati and Dayton, OH and Northern Kentucky service areas are eligible to enter. Employees, officers, and directors of Sponsor, Charter Communications Operating, LLC, Morris Furniture Co., Inc., and each of their respective parents, subsidiaries, affiliates, distributors, retailers, sales representatives, advertising and promotion agencies (collectively, the “Promotion Entities”) and the immediate family members (spouse, domestic partner, cohabitant, child, stepchild, grandchild, parent, stepparent, mother-in-law, father-in-law, son-in-law, daughter-in-law, grandparent, brother, sister, half-brother, half-sister) and/or those living in the same household of each, are ineligible to enter the Sweepstakes or win a prize. Sweepstakes is void where prohibited by law. To enter, regardless of method of entry, you will have to visit a participating Morris Home, Ashley HomeStore, Better Sleep Shop, or Morris Back Room location (each, a “Store”).Such stores are as follows: Morris Home stores located at 2121 Harshman Road, Dayton, OH 45424; 5695 Wilmington Pike, Centerville, OH 45459; 11765 Commons Blvd, Springdale, OH 45246; 8040 Burlington Pike, Florence, KY 41042; 3850 Morse Road, Columbus, OH 43230. Ashley Home stores located at 161 Mall Woods Drive, Dayton, OH 45449; 2850 Centre Drive, Beavercreek, OH 45324; 11755 Commons Drive, Springdale, OH 45246; 8040 Burlington Pike, Florence, KY 41042; 4530 Eastgate Blvd, Cincinnati, OH 45245; 5600 Deerfield Blvd, Mason, OH 45040; 9687 Colerain Ave, Cincinnati, OH 45251; 3622 W. Dublin-Granville Road, Columbus, OH 43235; 2800 Brice Road, Reynoldsburg, OH 43068; and 3883 Gramercy Street, Columbus, OH 43219. Morris Back Room: 2377 Commerce Center Blvd, Fairborn, OH 45324. In November, two (2) additional stores will open and entries will be accepted: Morris Home & Ashley HomeStore at 1280 Gemini Parkway, Columbus, OH 43240. Entries are also accepted at all Better Sleep Shop showrooms located inside each of the above Morris Home and Ashley HomeStore locations. 1. IN-STORE BUYER: To enter by making a purchase, during the Sweepstakes Period visit a participating Store showroom and make a purchase. While completing your purchase, you will have the opportunity to opt-in to the Sweepstakes while at the point of sale and receive one (1) entry into the random drawing for the day of your purchase and all subsequent daily drawings, if any. Alternatively, you may choose to complete an entry form on an in-store kiosk. 2. 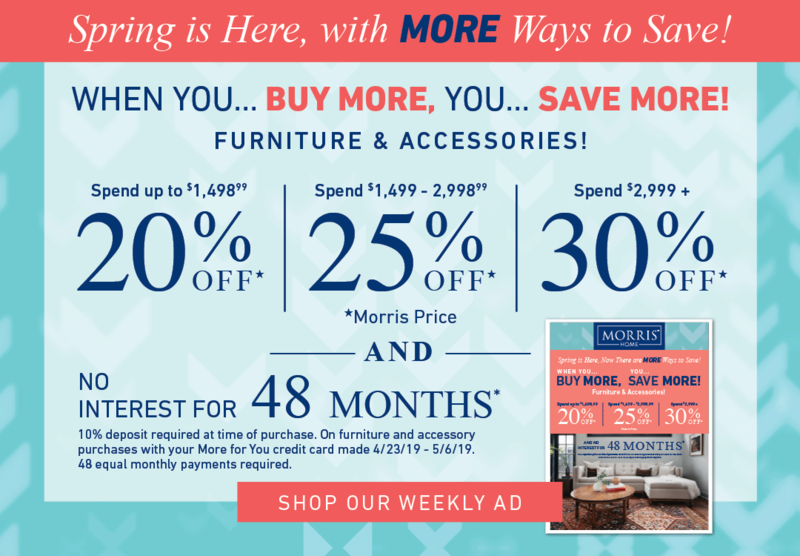 IN-STORE NON-BUYER:To enter in-store without making a purchase, visit a participating Morris Home, Ashley HomeStore, Better Sleep Shop or Morris Back Room showroom. While in the store, complete an entry form on an in-store kiosk. All entries must be completed by close of business on 11/22/17 to be eligible. In the event a dispute regarding the identity of the individual who actually submitted an entry cannot be resolved to Sponsor’s satisfaction, the affected entry will be deemed ineligible. The Promotion Entities shall not be responsible for incorrect or inaccurate entry information whether caused by Internet users or by any of the equipment or programming associated with or utilized in the Sweepstakes or by any technical or human error which may occur in the processing of the entries in the Sweepstakes. The Promotion Entities assume no responsibility or liability for any error, omission, interruption, deletion, theft or destruction, or unauthorized access to, or alteration of entries. Limit one (1) entry per person per day, regardless of method of entry. Entries received from any person or email address in excess of the above stated limitation will be void. WINNER SELECTION AND NOTIFICATION: At of the conclusion of each Entry Period, one (1) potential prize winner will be randomly selected from all eligible entries received during such Entry Period, for a total of seventy (70) potential prize winners. The potential prize winners will be notified by telephone and/or mail and/or e-mail, using contact information provided or collected at the time of entry. Sponsor shall have no liability for any winner notification that is lost, intercepted or not received by a potential winner for any reason. If, despite reasonable efforts, a potential winner does not respond within seventy-two (72) hours of the first notification attempt, or if the prize or prize notification is returned as unclaimed or undeliverable to such potential winner, such potential winner will forfeit his or her prize and an alternate winner may be selected. Sponsor, in its sole discretion, will attempt to contact up to three (3) potential winners of a prize in accordance with the above procedure, after which the prize in question may go unawarded if it remains unclaimed. If any potential prize winner is found to be ineligible, or if he or she has not complied with these Official Rules or declines the prize for any reason prior to award, such potential prize winner will be disqualified and an alternate prize winner may be selected. The odds of winning depend on the number of eligible entries received throughout the Promotion Period. PRIZES: A minimum of Seventy (70) Prizes are available. 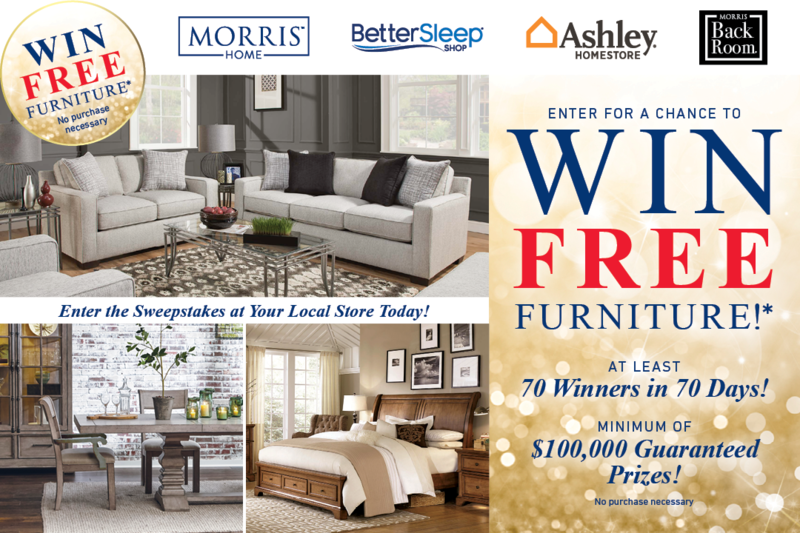 Each Prize consists of a gift card valid for use in a Morris Furniture Company showroom, Morris Home, Ashley HomeStore, Better Sleep Shop or Morris Back Room, the amount of which will depend on the Entry Method by which the winner entered. If the Prize winner entered via Entry Method 1, the gift card will be equal to the amount of their total of all purchases made at all Morris Furniture Company stores with the same customer name and customer code on the date associated with their winner selection. The prize amount will be equal to the amount of all merchandise and protection plan purchases, excluding any additional tax and delivery fees. If a Prize winner entered via Entry Method 2, the gift card will be equal to the average amount of all purchases made throughout the Promotion Period up through the date of the drawing. A guaranteed minimum of $100,000 in prizes will be available. If, at the conclusion of the Promotion Period less than $100,000 in prizes has been awarded, we will continue to select additional potential winners from the remaining eligible entries received until at least $100,000 in prizes has been awarded. Confirmed winners will receive a voucher from Sponsor for the amount of the Prize received. Once they have received the voucher, such confirmed winner must visit a designated Morris Furniture Company store within thirty (30) days of receiving their Spectrum Reach voucher to trade the voucher for a Morris Furniture Company gift card. The Morris Furniture gift card will be valid for six (6) months from date of issue with no extensions permitted. Gift cards are subject to certain terms and conditions as specified by issuer. Limit one (1) prize per household. GENERAL PRIZE CONDITIONS: No cash alternative or prize substitutions will be allowed, except Sponsor reserves the right to substitute a prize of comparable value if any prize listed is unavailable for any reason. Prize winners shall be solely responsible for all federal, state and/or local taxes, and the reporting consequences thereof, and for any other fees or costs associated with the applicable prize. Any potential prize winner may be required to execute and have notarized an Affidavit of Eligibility, a Liability Release, and (where imposing such condition is legal) a Publicity Release (collectively, “Prize Claim Documents”). If winner fails to respond to prize notification from Sponsor within the time frame specified, or fails or refuses to sign and return all Prize Claim Documents within five (5) days of prize notification (or a shorter time if required by exigencies), winner may be disqualified and an alternate winner may be selected. Winners of prizes valued at $600 or more must provide their social security number for tax reporting purposes and will receive an IRS form 1099 following receipt of the prize for the total actual retail value of the prize received. Sponsor makes no warranties, and hereby disclaims any and all warranties, express or implied, concerning any prize furnished by third parties in connection with the Sweepstakes. WITHOUT LIMITING THE GENERALITY OF THE FOREGOING, SUCH PRIZES ARE PROVIDED “AS IS”WITHOUT WARRANTY OF ANY KIND, EITHER EXPRESS OR IMPLIED, AND SPONSOR HEREBY DISCLAIMS ALL SUCH WARRANTIES, INCLUDING BUT NOT LIMITED TO, THE IMPLIED WARRANTIES OF MERCHANTABILITY, FITNESS FOR A PARTICULAR PURPOSE AND/OR NON-INFRINGEMENT. GENERAL: Acceptance of a prize constitutes prize winner’s permission for Sponsor and its designees to use prize winner’s name, photograph, likeness, voice, biographical information, statements and address (city and state) for advertising and/or publicity purposes worldwide and in all forms of media now known or hereafter developed, in perpetuity, without further compensation. Entrants agree that the Promotion Entities (A) shall not be responsible or liable for, and are hereby released from, any and all costs, injuries, losses or damages of any kind, including, without limitation, death and bodily injury, due in whole or in part, directly or indirectly, to participation in the Sweepstakes or any Sweepstakes-related activity, or from entrants’ acceptance, receipt, possession and/or use or misuse of any prize, and (B) have not made any warranty, representation or guarantee express or implied, in fact or in law, with respect to any prize, including, without limitation, to such prize’s quality or fitness for a particular purpose. Sponsor assumes no responsibility for any damage to an entrant’s or any other person’s computer system or wireless phone which is occasioned by accessing the Website or otherwise participating in the Sweepstakes, or for any computer system, phone line, hardware, software or program malfunctions, or other errors, failures, delayed computer transmissions or network connections that are human or technical in nature. Without limiting the generality of the foregoing, Sponsor is not responsible for incomplete, illegible, misdirected, misprinted, late, lost, damaged, stolen, or postage-due submissions or prize notifications; or for lost, interrupted, inaccessible or unavailable networks, servers, satellites, Internet service providers, websites, or other connections; or for miscommunications, failed, jumbled, scrambled, delayed, or misdirected computer, telephone or cable transmissions; or for any technical malfunctions, failures, difficulties or other errors of any kind or nature; or for the incorrect or inaccurate capture of information, or the failure to capture any information. Sponsor reserves the right in its sole discretion to disqualify any individual who is found to be tampering with the entry process or the operation of the Sweepstakes or the Website, to be acting in violation of these Official Rules, or to be acting in an unsportsmanlike or disruptive manner, or with the intent to disrupt or undermine the legitimate operation of the Sweepstakes, or to annoy, abuse, threaten or harass any other person, and Sponsor reserves the right to seek damages and other remedies from any such person to the fullest extent permitted by law. No mechanically reproduced, illegible, incomplete, forged, software-generated or other automated multiple entries will be accepted. Sponsor reserves the right to modify, extend, suspend, or terminate the Sweepstakes if it determines, in its sole discretion, that the Sweepstakes is technically impaired or corrupted or that fraud or technical problems, failures or malfunctions or other causes beyond Sponsor’s control have destroyed or severely undermined or to any degree impaired the integrity, administration, security, proper play and/or feasibility of the Sweepstakes as contemplated herein. In the event Sponsor is prevented from awarding prizes or continuing with the Sweepstakes as contemplated herein by any event beyond its control, Sponsor shall have the right to modify, suspend, or terminate the Sweepstakes. If the Sweepstakes is terminated before the designated end date, Sponsor will (if possible) select winner(s) in a random drawing from all eligible, non-suspect entries received as of the date of the event giving rise to the termination. Inclusion in such drawing shall be each entrant’s sole and exclusive remedy under such circumstances. These Official Rules cannot be modified or amended in any way except in a written document issued by a duly authorized representative of Sponsor. The invalidity or unenforceability of any provision of these Official Rules shall not affect the validity or enforceability of any other provision. In the event that any provision is determined to be invalid or otherwise unenforceable or illegal, these Official Rules shall otherwise remain in effect and shall be construed in accordance with their terms as if the invalid or illegal provision were not contained herein. GOVERNING LAW/JURISDICTION: ALL ISSUES AND QUESTIONS CONCERNING THE CONSTRUCTION, VALIDITY, INTERPRETATION AND ENFORCEABILITY OF THESE OFFICIAL RULES OR THE RIGHTS AND OBLIGATIONS OF ENTRANTS OR SPONSOR IN CONNECTION WITH THE SWEEPSTAKES SHALL BE GOVERNED BY AND CONSTRUED IN ACCORDANCE WITH THE INTERNAL LAWS OF THE STATE OF OHIO WITHOUT GIVING EFFECT TO ANY CHOICE OF LAW OR CONFLICT OF LAW RULES OR PROVISIONS THAT WOULD CAUSE THE APPLICATION OF ANY OTHER STATE’S LAWS. WINNERS’ LIST: For the winners’ list, send a self-addressed, stamped envelope to: Win Free Furniture Winners, Spectrum Reach, 8087 Washington Village Dr., Suite 204, Centerville, OH 45458. All such requests must be received within six (6) weeks after the end of the Promotion Period.